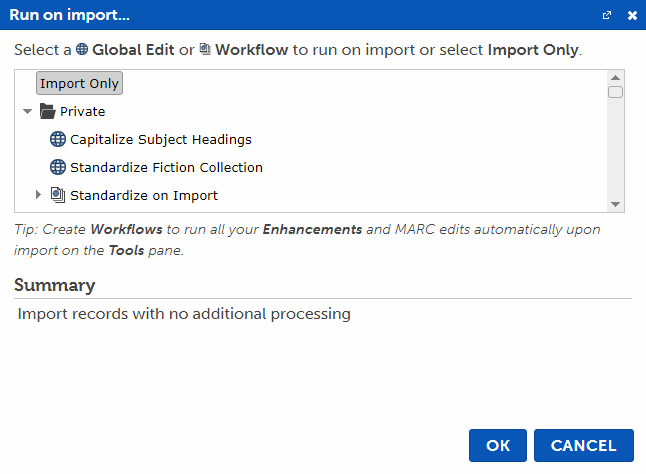 A Global Edit or Workflow can be selected to perform standardization (including Enhancements) when you bring your records into BestMARC. After a file has been imported and any additional processing has completed, your records will appear in the My Records grid. Use Checkpoints to view a side-by-side comparison of the original record and changes made by the selected processing options. New Records - A file of new records that has never been in your automation system before. Existing Records - A file of records that are already in your automation system that you want to update. Use BestMARC to manage both kinds of files. The process of putting the records back into your library automation system may vary depending on if the records are new or existing. New records are records that have never been in your library automation system before. These are typically vendor records or records you have found online or using other software. You will typically already have a MARC file or several MARC files depending on your source. If you have records that are already your library automation system and would like to update, follow our Instructions to export your file from you automation system. 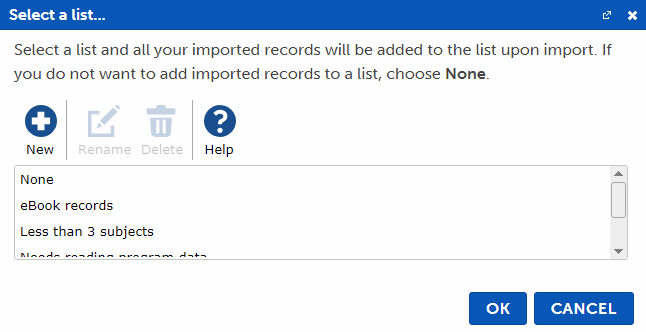 Choose Export records from my LAS and follow the instructions. Click the Import button if it is not already selected, or select File > Import MARC file from the menu on the My Records tab. The Storage text displays how many records your organization can hold in BestMARC and how much of that space is already used. Use the Account page to see more detailed storage information for all users. If your file exceeds your storage capacity, the file will not be loaded into BestMARC. Select a Global Edit or Workflow if you want to automatically perform standardization on this file. Otherwise select Import Only. Select a List and click OK.
See the Lists documentation for more details. Browse your computer for the MARC file(s) you would like to import and select them. Select multiple files by holding down the Ctrl key on your computer. Only MARC files are allowed. The file names and sizes for the files you have selected are displayed. Click Start Upload. The selected files are uploaded to the BestMARC servers. If there were any errors, a message is displayed. Fix the problem and try again. The records are processed with the chosen options and added to the My Records grid. The Status of the import is periodically updated on this tab. You can continue working in BestMARC or close it and your import will continue processing. When your import has finished, a report appears in the same tab. If you would like to view the report again, recent reports can be viewed again from the Notifications area at the top of the screen or in the Activity Log on the Account page. Exported MARC files can be directly imported back into BestMARC™ from the Downloads tab. Use this feature to easily pass MARC records among colleagues. Right-click it and choose Import from the menu. Select the File > Import item from the grid's menu. A new tab opens while the records are imported and added to the My Records grid. The Status of the import is periodically updated on this tab. You can continue working in BestMARC or close it and your import will continue processing. A message appears in the same tab when the file has finished importing.